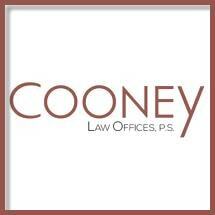 Cooney Law Office, P.S. is a local, multi-practice law firm emphasizing the needs of individuals. With attorneys practicing in the areas of Personal Injury & Auto Accidents, DUI & Criminal Defense, Family Law, Estate Planning & Probate, and Employment Law, Cooney Law strives to assist those who need us most, and to alleviate the stressors of every day life. Whether you're looking for someone to take on the big insurance companies after an injury, want to protect your rights as a parent, or need guidance in planning for your future, Cooney Law Offices, P.S. is ready to help. Don't Settle For Less. John Cooney & Associates, P.S.